Dust mite allergy is one of the most common allergies that Americans suffer from. It is estimated that more then 80% of those suffering from allergies are also allergic to dust mites. Teary eyes, runny nose, stuffy nose, dry cough, and headaches. Most people suffer from it without even realizing. If you tend to wake up in the morning congested there is a very good chance you may suffer from dust mite allergies. PURE SERVICE PRO experts can help you to decipher if your home/office is affected by dust mites and eliminate them. Dust mites can be found in all households or offices, almost without exception. They live in carpets, fabric upholstered furniture, curtains and most of all in beds. 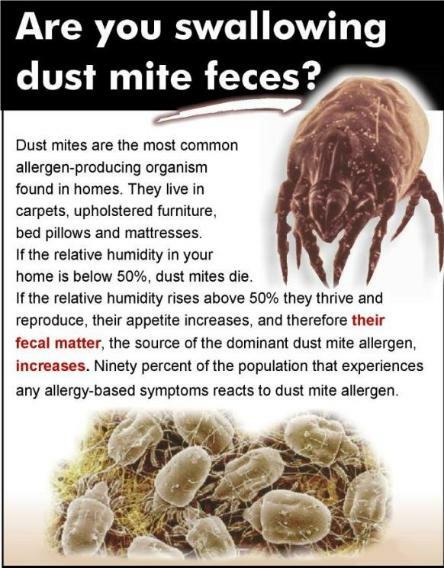 Dust mites feed on shed human skin, and can live anywhere the humidity is above 40% and there are humans. It is estimated that each person sheds approximately the equivalent to a paper clip’s worth of dead skin every day, providing an abundant food source for dust mites. PURE SERVICE PRO experts use significant methods to discover dust mites, and environmentally friendly methods to remove them from your indoor environment.